A woman’s shaver is a huge part of her world. She has large parts of her body that need to be smooth and supple to the touch. Hair removal is crucial, and so is her choice of shaver. Manual shavers are slow and tedious, so many women are switching to electric shavers. In this guide, we’ll cover the best women’s shavers. 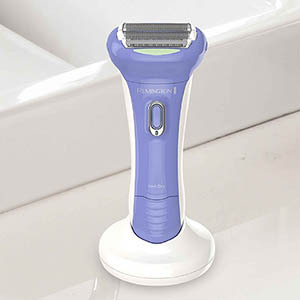 The best electric shaver for women will remove hair quickly and smoothly. The shaver will have trimmers and other accessories for a complete, detailed shave. The best women’s shaver will be a wet/dry version that she can use in the shower, too. We will detail all the right shavers as well as why we believe they’re the perfect choice. Let’s move on to our 10 picks from the top-notch female electric shavers available in the market. The Braun epilator has a 40% wider head to remove more hair with one pass. With a single stroke, the tweezers will grip and pull out more hairs. This will ensure less pain when you spend less time removing hairs. The MicroGrip Tweezer Technology uses wider, deeper, and longer tweezers for hair removal. With waxing, hair has to be a certain length. The hair can be 4x shorter when using the epilator. 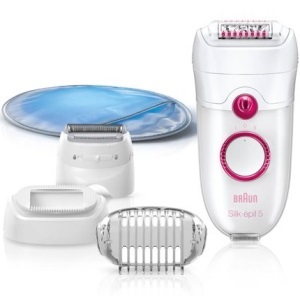 The Braun Silk epilator comes with 7 attachments and extras. There are 5 caps to be used on various parts of the body. It comes with a cover for travel as well as a travel charger. The epilator comes with a facial brush for deep cleansing of the face, too. The facial brush removes makeup and cleans deep into pores on the face. You might want to use this epilator with attachment on your delicate face. Your skin should be as clean as possible before use. Along with a travel charger and cover, there’s a pouch for you to take this with you everywhere. Using the epilator means that you’ll be hair free for weeks, but you might need to take this with you on vacation. This epilator can be used in the bath or shower. It’s meant to be used wet or dry depending on your preferences. Beginners might want to use this with shaving foam or gel to make the hair easier to remove. It will be less painful. It can be incredibly painful to remove hair using an epilator. This makes it very important to have a wide head. It gets rid of more hair with each pass. The process will be quicker and less painful with use. The MicroGrip Technology makes epilating more precise and faster. The pivoting head adapts to the contours of the body. It’ll give you better coverage on each pass. That makes it more efficient and ultimately reduces the pain. Many of the features of an epilator like this one are meant to reduce pain. It can be very painful to use an epilator, but the hair free experience is worth the uncomfortable feelings. Pulsing vibration during hair removal to massage pain away. Works wet or dry for comfort. Pivoting head for more hair removal. MicroGrip Technology for faster hair tweezing. SmartLight reveals more hair for removal. This epilator can't be used while it's charging. Overall, this is a great epilator. It has a variety of caps for all the places you might want to remove unwanted hair. It can even remove hair from your face and chin. It will remove much of your hair in one pass, too. This electric shaver has floating foils for a close shave. The head floats independently to stay in contact with your curves. You can easily move from the front of your calf to the knee and beyond with this floating head. It'll give you smooth results on the underarms, too. Panasonic provides sharp, stainless steel blades in all their shavers. The foil is meant to smooth and protect the skin while lifting hairs for cutting. That's the secret behind their ability to provide a shave that is free of irritation and bumps. 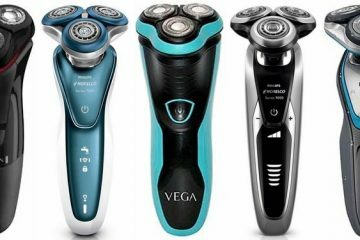 There are 3 blades to provide a close shave that won't leave strays behind. You don't want to have to make more than one pass over the skin. That can result in irritation, too. The shaver comes with a popup trimmer attached to the top of the shaver. It will provide a way to remove long or stray hairs that you don't want to shave. Unfortunately, not all hair grows at the same rate. A trimmer is a great convenience. You don't have to worry about losing it, either. It's attached. As far as charging, this shaver comes with a space-saving charger. It plugs directly into an outlet. The shaver will attach to the outlet keeping it off the counter. The wet/dry shaver can be used for any area of the body. From underarms to the back of the thighs, it'll give you a close, smooth shave. Your skin will be silky smooth after using this shaver. It can even be used in the bikini area. The attached trimmer can take care of any stray hairs before shaving, too. With the wet/dry technology, that allows you to use the shaver in the shower with foam or gel. That's the best way to shave your legs. It reduces irritation and razor bumps, which can be very unattractive when you're heading to the beach in a bikini. The floating head will follow a woman's many curves to ensure that all the hair is removed. It'll reduce the need to pass over the area multiple times, too. The foils will smooth the skin and lift the hairs at the same time to give a close shave. It's easy to rinse clean. Foil blades will float over the skin. Comes with a space-saving charger. Has a popup trimmer on the top for stray hairs. The shaver can be a bit loud. The best women's electric razor doesn't have to included tons of extra accessories. This shaver has a trimmer and the ability to be used in the shower. It delivers a smooth shave that leaves skin silky and ready for the beach. The Silk 5 has enough power and tweezers to remove even the shortest hair. You won't have to wait days to use the epilator to remove unwanted hair. There are 40 tweezers that are considered close-grip to get even the shortest hair. The corded epilator has a high-frequency massage system. This system massages the skin during hair removal. It helps to reduce pain. When hair removal is more comfortable, you'll do it more often. Over time, that reduces the pain, too. The SmartLight will reveal all the hairs to be removed. Even the finest hairs will be revealed with this light. That allows for better hair removal. The pivoting action keeps the head in contact with your skin throughout the process. This leaves you with less hair to be removed with every pass. That will provide you with less irritation as the hair is plucked with the device. This epilator also comes with a shaver head. Instead of using one method of hair removal, this device uses two. You'll be able to choose your own speed during hair removal, too. There are many accessories and features to recommend with this device. It's an epilator, but there's also a shaver head. The foil head can be used with the trimmer for sensitive areas that you don't want to pluck. The massage roller system gives you a more comfortable experience along with the soothing glove. The cooling glove is meant to soothe your skin before and after epilation. While cordless shaving and epilation has its place, it can be a pain to worry about the charge in your device. That's never a worry with this corded epilator. You can't take it into the shower, but it's fantastic for a quick pass over the skin before you run out the door. Corded epilation and shaving for uninterrupted hair removal. Includes a cooling glove and shaving attachment. Fully washable under running water. It can't be used in the shower to combine activities – even if you're using the shaver attachment. The Silk 5 is a nice change from the cordless epilators and shavers that are dependent on a full charge. You can use this any time. The epilator can remove the smallest hairs, so it's fantastic for a quick pass before heading out the door. The angled head of this foil shaver keeps the foils smooth against the skin. This gives you a more comfortable, close shave without irritation. The irritation often comes from multiple passes on the skin to remove missed hairs. The foils are designed to be open to the blades. Hair will pass through the foil to the blades uninterrupted. This means that long or short hair won't matter as the blades cut them close to the skin. There's a flex dual-sided trimmer on the top of this shaver. This prepares the hair before the foils move in to do their job. Some hair can be longer than others. The trimmer lines up the hairs for cutting. There's a strip of almond oil right on the shaver itself. It will smooth and nourish your skin. With every pass of the shaver, the oil gets left behind to soften the skin. It will leave your skin smooth and silky. The shaver is completely waterproof, so you can use this in the shower. It's great with shaving gel or cream combined with the almond oil strip, too. The foils with 4 blades will give you fast results for your shaving efforts. Nobody wants to stand in the shower making pass after pass on her legs or underarms. It's even worse if you have a problem trimming your bikini area. Multiple passes can be irritating to the skin creating bumps. This foil shaver is hypoallergenic. It also comes with a strip of almond oil directly on the shaver itself. As you're shaving, a layer of almond oil is left behind to smooth and nourish your skin. That's even better than adding moisturizing or cooling lotion after you get out of the shower. The angled head and bikini trimmer allow you to get into the curves easily without nicks or cuts. It'll stay flush to the skin no matter what area of the body is being shaved or trimmed. Open-blade foil system for close shaving. Dual-sided trimmer for varied hair lengths. Angled head to keep the foils close to the skin. Almond oil strip for moisturizing. Wet/dry technology for use in the shower. The charge time is 20 hours for 30 minutes of use. It can be left charging overnight, though. There are great features included with this shaver. There are 4 blades behind the open foils to cut all lengths of hair. It's great when using the trimmer on the bikini area especially. It'll move with your curves and cut longer hair. This rotary shaver is unusual looking, but that's a great thing. The handle is easy to hold in the palm of your hand. It makes shaving parts of the body much easier. It can be used on the back of the thighs without contorting your upper body. There are 5 heads on this rotary shaver. Each of the heads will move and adjust to your curves. The back of the thighs, the back of the knees, or the curves leading to your bikini area will all benefit from this rotary shaver. Each shaving head has 3 cutters. It's perfect for sensitive skin. Instead of a vertical motion on the legs or other areas of the body, the rotary shaver allows for circular shaving. It'll stop nicks and cuts that can result from other shavers that aren't used properly. The shaver has a rechargeable battery that can be fully charged in 2 ½ hours. That time will give you 90 minutes of shaving. That's plenty of time to get all the areas that you need shaved. This shaver is perfect for beginners who are being introduced to shaving. Young girls can be intimidated by foil shavers that need a certain up and down motion to shave correctly. They might be too young for a safety razor, too. The Butterfly shaver can be great for the backs of the thighs and backs of the knees. It's not always easy to see those areas while in the middle of shaving. The Butterfly shaver doesn't require you to see what you're doing while shaving. It has a unique handle that will fit in the palm of the hand. That makes it easy to press the shaver against the skin. It won't become uncomfortable or fall out of your hand, either. Beginners will love this shaver. It can also be used for other body parts. Men shaving their head can benefit from this shaver, too. 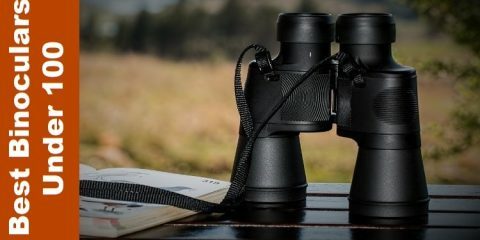 Ergonomic handle is unique and comfortable. Has 5 flexible shaving heads. Rotary shaver for circular shaving motions. Great shaving time based on charge time. Doesn't include any real attachments or accessories. While this is a good shaver for beginners, it's great for all kinds of shaving. It seems created especially for areas like the backs of the thighs and knees where it's hard to see. The flexible nature of the shaver allows for all your curves. 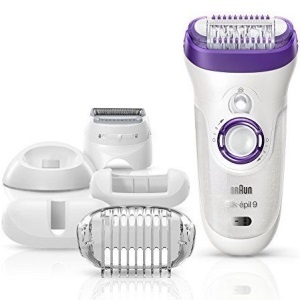 This combination epilator and shaver has 6 attachments. There's a shaver head for shaving general areas like your legs. There's a Bikini Comb for gentle shaving of your bikini area. There's a Dual-Disc Epilator Head for tweezing large areas like the thighs or calves. There are two epilator head attachments, too. They're meant for small, sensitive areas like the underarms. Lastly, there's the pedicure buffer for giving yourself a pedicure. In the epilator head, there are almost 50 rotating tweezers. They will quickly grab hairs and pull them out cleanly. The quickness and strength of the 48 tweezers is meant to give a cleaner extraction with less pain. The shaver head has the same foil and stainless steel blades that are available in Panasonic shavers. It's gentle on your skin, which makes it a great shaver for your entire leg. The head pivots 30 degrees forward and backward to keep in close contact with the skin. The shaver and epilator can be taken into the shower. It's quicker when you can shave in the shower before heading out the door. With your favorite shaving gel, you're getting a closer shave in the shower or bath. It'll rinse clean under running water, too. It's 100% waterproof. An added bonus on this shaver and epilator is an LED light for illuminating thin, hard-to-see hair. It also comes with a cleaning brush and travel pouch. You can easily take this with you on vacation. There are times when you'll want to use a shaver and other times you want to remove hair completely. It's likely a time when you want to roll out of bed and head to the beach. Using the epilator means you can experience a week or two of smooth, hair-free skin. Epilators can be incredibly painful, but this one features a multitude of fast tweezers. They will pluck the hair quickly and virtually pain free. The extra caps will give you focused hair extraction. When you're in the shower, you want to be able to see exactly where you're shaving or tweezing. The LED is a delightful bonus. The fact that you can actually take it into the shower is great, too. Especially if you want to use foam or gel with the shaver. It's also possible to use foam or gel to soothe your skin while using the epilator. 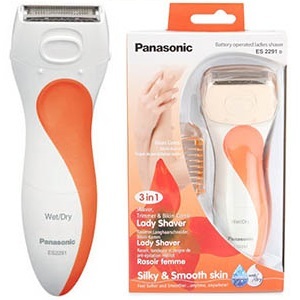 100% waterproof shaver and epilator for use in the shower. Built-in LED illumination for light hairs. The shaving head is wide enough for large surfaces. Features 48 tweezers in the epilator. Dual speed modes for sensitive users. It takes an hour to charge for 30 minutes of use. 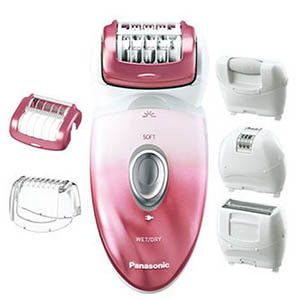 This epilator and shaver provides many attachments for shaving or tweezing. It has varied speeds for sensitive users, too. I'd recommend this shaver and epilator for those who want the option of using either type of hair removal. The dual floating foils have the same technology as many of the shavers they produce. The floating foils move independently of each other. The neck flexes to give you a close shave on all your curves. That's important for the bikini area as well as the underarms. The shaver attachments include a 2-in-1 shaver and trimmer for performing dual activities on any area. There are other attachments, too. There's an efficiency cap and bikini trimmer head. There are 2 speed settings to ensure that you're getting a comfortable shave in any area. The dual foils will move and angle with the curves, and the speed will matter for the kind of shave you want. The SatinShave has pearl tips on the trimmer to keep the trimmer from scraping the skin. It reduces irritation. That's also true of the comfort shaving cushions. These cushions surround the shaver to help avoid cuts and scrapes in sensitive areas. 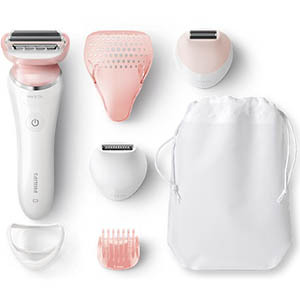 The shaver that you use for your legs, bikini area, and underarms has to be sensitive and the design has to be thoughtful. That's definitely the case with this shaver. The comfort cushions and pearl tip trimmer was created by a company that wants to ensure a woman's comfort. This shaver comes with accessories you'll need for all your shaving needs. There are extra caps and combs for a variety of shaving and trimming. There's even a travel cap and travel pouch, so you can take this shaver on your next vacation. The lithium-ion battery doesn't take hours and hours to charge. It'll be charged in an hour for 1 hour of use. It can do a quick charge of 5 minutes to shave before you head out the door to the beach or a date. Pearl tip trimmers for comfort in all areas. Comfort shaving cushions to avoid irritation. Cordless use in or out of the shower. Has 2 speed settings for customized power. Quick charging for plenty of shave time. This device isn't designed for use on the face. If you are looking for a great bikini shaver, this is the one you need. I'd recommend this shaver for women who want to control the power of the shaver. It's fantastic that the shaver has the choice of speed settings. It can be changed based on the area to be shaved like the bikini area or under the arms. The shaver provides a wet/dry option that means you can use it dry when you need to run out the door. You can also take your time and get a smooth shave in the bath or shower. It's rounded to adapt to the natural contours and curves of a woman's body. Whether it's underarms, back of the knee, or bikini area, the curves are where a woman needs to get a great shave. There are plenty of attachments with this shaver to provide a customized shaving experience. There are rounded trimmers for the bikini area. While shaving, you can use the exfoliation attachment in case you didn't exfoliate before grabbing the shaver. Along with those attachments, there's a bikini trimmer for sensitive areas that you want to trim.. There's also an OptiShave attachment. That's for getting a really close shave on your legs. You can remove all the attachments for shaving your legs if you've allowed the hair to grow. That can happen during the winter when your legs are usually covered. The attachments give this shaver all the optimization and customization you could possibly need. There are attachments for all areas of the body. Bikini areas, underarms, or a close shave on the legs, they're all taken care of with this one shaver. This is a great shaver for travel. It has everything you need for a trip to a sunny vacation locale. You don't need to worry about charging this shaver, either. It comes with 2 AA batteries. You can easily replace them when you need more power in your shave, too. The shaver can be used in the shower for a smooth shave. It can also be used dry before running out the door. It's good if you find yourself wearing a tank top but haven't addressed your underarms in a while. Zip the shaver across your underarms for a smooth shave really quickly. Rounded head for following your body's curves. Plenty of attachments for a variety of shaving needs. Great for travel since it doesn't need a cord. Wet/dry technology for versatile shaving. Wet/dry shaving but it can't be submerged in the bathtub. This is a great shaver for travel since it uses batteries. There are so many attachments it's like getting 4 different shavers for the price of one. I'd recommend this shaver for anyone who wants a smooth shave over multiple areas. The Close Curves shaver is a convenient travel size. It's completely cordless and operates with 1 AA battery. You won't have to worry about international voltage while traveling with this shaver. It's a foil shaver with a floating head system. The floating heads of this shaver ensure that it will follow your curves. That includes your legs, the backs of your knees, or underarms. It's great for the curves in your bikini area, too. That's what you want when you're traveling with this shaver since you'll probably be at the beach. The hypoallergenic blades are crafted from steel that doesn't use nickel. For a truly hypoallergenic experience, there are many people who need blades that aren't created with nickel. The handle of the shaver includes a popup trimmer for the bikini area. It'll keep the skin from being nicked and cut. The trimmer isn't a separate attachment, so it'll never get lost. When it comes to a great travel shaver, this one is hands-down one of the best. The fact that it takes batteries is a huge plus. You don't have to worry about charging this, so global voltage isn't a consideration. When it needs to be charged, just pop in new batteries, and you're good to go. It's a slim, portable shaver that fulfills all your shaving needs. The popup trimmer attached to the shaver is a great feature. It's another plus for a travel shaver. It's a space-saving feature as well as time saving. This hypoallergenic shaver works great in the shower. For those who have incredibly sensitive skin, you'll be happy to know that this has nickel-free blades. Wet/dry shaving technology for quick shaves in the shower. Hypoallergenic nickel-free blades for sensitive skin. Operates using 1 AA battery. Includes popup trimmer attached to the handle. Doesn't have a pivoting head. 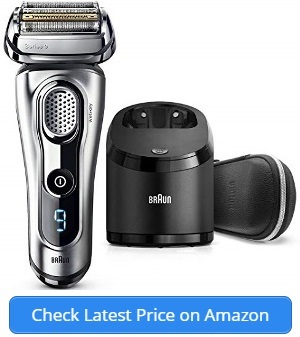 This shaver is recommended for those who want a travel shaver that doesn't rely on charging. Aside from the travel convenience, this shaver is a great option for those who have nickel allergies. The blades are hypoallergenic and nickel-free. The SatinShave has a foil design that moves naturally over the curves of your body. It doesn't matter where you're shaving. The foils will glide smoothly without nicks and pain. It'll provide an even shaving experience, too. No stray hairs will be left behind. Trimmers that will move the hair into the foils doesn't come with square tips like others. The tips are pearl shapes to provide comfort. Those with sensitive skin will appreciate that the tips won't cause irritation. There's a cap with trimming comb for use in the bikini area. That's where you'll most appreciate the curved, pearl shape of the trimmer. It won't scrap or cut this sensitive area or cause irritation bumps. The SatinShave can be used wet or dry. For that reason, and more, the handle is ergonomic. It's shaped like an S, which allows you to keep a firm grip on it. In fact, the handle won a 2016 iF design award for ergonomics. There's a battery indicator light for you to easily see how long you have until the shaver needs to be charged. This is important because the device needs to be charged for 8 hours for 1 hour of cordless use. The cordless shaver can be used in the shower or quickly before heading out the door. You might need a quick touchup before heading out the door to the beach. This kind of dual usage allows you to use the shaver as you see fit. The floating foil heads glide across the skin, which has a couple of benefits. The foils don't need to be wet or have shaving gel to give a smooth shave. It won't cause irritation or pulling, either. The foils will maintain close contact with the skin providing a better shave. If you decide to use this shaver in the shower, you're benefiting from the ergonomic design of the handle. It won't slip from your hand, which gives you a solid shave with confidence. Cordless shaving in or out of the shower. S-shaped, ergonomic handle design for a firm grip. Rechargeable lithium-ion battery for 1 hour of shaving. Battery indicator on the handle. Attachments for the bikini area to help avoid irritation. Has to be charged for 8 hours when the battery is drained. A shaver like this helps you avoid using a safety razor, which might not be as safe as described. This foil shaver has way more benefits. It has an ergonomic handle and floating foils that help smooth the skin for a close shave. I recommend this shaver for those who want a quick shave before heading to the beach. It won't irritate the skin. The life of the charge matters when you’re shaving. The shaver you choose should be a quick charge that lasts as long as you need it for at least one shave. 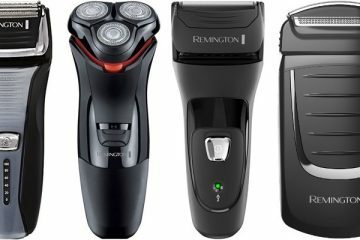 Most shavers last between 30 and 90 minutes per charge. That’s a good amount of time for a shaver. The shaver that you choose should be easy to clean. Some of them might not have wet/dry technology. It’ll be important to check to see what kind of cleaning is needed. If it’s a dry technology, the shaver should come with a brush of some sort to clean it thoroughly. This allows the shaver to be taken into the shower. When you can use the shaver with shaving cream or gel, you’re getting a closer shave. It’ll smooth your skin and prevent irritation, too. If you have sensitive skin, it’s important that you purchase a wet/dry shaver to give yourself options. The head of the shaver should be flexible enough for movement. It needs to follow your curves. From the back of the knees to the bikini area, there are plenty of curves that need flexible shaving heads. The best women’s shaver will move with the curves of her body. All of these options should be standard with the shaver that you choose. Sharp blades and a fast motor will ensure that you’re getting the closest shave possible. Trimmers are good for the bikini area, which is a spot most women want to shave. Shavers have a certain amount of shaving time based on the type of battery. Whether it’s a lithium-ion or not, the shaver will provide a half hour to an hour and a half of shaving time. If you don’t use that entire time in one shave, the shaver will have to alert you when it needs to be charged. Your lifestyle will dictate the kind of shaving that you need. For some, they want the power and ability to shave outside of the shower. If you want a corded shave experience, that’s something you should search for in your new shaver. Otherwise, you’ll be at the whim of the power and lack of charging. You’ll want the closest shave possible. That can come from rotary or foil options. It will depend on the kind of shaving you want. For some women, the back of the thighs and knees are problem areas. They would do better with a rotary shaver. It’s good for beginners, too. Otherwise, foil shaving works beautifully as well. Rotary or foil shaving have much the same procedures as shaving with a razor. You'll need to do some preparation if you have sensitive skin. You'll also need to consider your after shaving care, too. If you're shaving dry, you won't have time or the inclination to use a gel or foam. After you shave, though, it's important to moisturize your skin. Keeping your skin hydrated can make it glow and keep it soft and smooth for longer. For shaving in the shower, soak the hair and your skin for a few minutes. Don't use very hot water, though. Stick with warm water that will soften the skin and hair. Hot water can make your skin swell, which won't give you a close shave. Apply a moisturizing shaving gel or foam. It'll allow the shaver to glide easily over the surface of the skin and remove hair. It'll do that without cutting or nicking the skin. That can cause serious irritation. 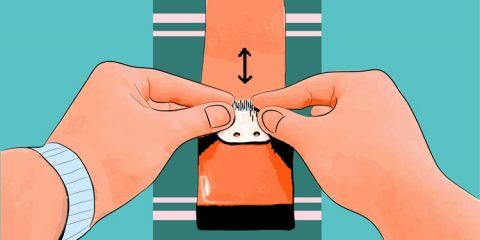 Start at the ankles and shave up to the knee. Let the shaver glide without putting undue pressure on the skin. For your underarms, shave in a variety of angles. In the bikini area, shave inward before any other direction. You might need to trim before shaving to keep the shaver from pulling your hair. After shaving, always apply a moisturizing lotion or cooling gel. It'll help you avoid irritation in the future. Foil or rotary! Which one is best choice for women? Answer: The choice is often a personal one. If you are a beginner or know a beginner, you might want to start off with a rotary. It allows you to move in circular motions and get places that you can’t see very well. Rotary and foil shavers are good for curves in sensitive areas. It’s a personal preference. Can a women use a men’s electric shaver? Answer: She definitely can use any shaver she wishes, but a woman’s shaver has customized accessories. It’ll have trimmers and shavers for sensitive areas like the bikini area. It’s best to choose a shaver designed for women. Is an electric shaver good for women with sensitive skin? Answers: Women with sensitive skin will be able to use an electric shaver. A safety razor can cause irritation while shaving. An electric one will have smoothing trimmers to ensure there’s no irritation. Are electric shavers good for young girls? Answer: A young girl who is ready to shave can find more success with an electric shaver. Safety razors can cause nicks and cuts for those who are inexperienced. It’s better to purchase her an electric shaver, so she doesn’t hurt herself. Why do women prefer an electric shaver over a manual shaver? Answer: Manual shavers, or safety razors, can cause serious cuts as well as irritation. That’s painful in sensitive areas like the bikini line where you want smooth, bump-free skin. An electric shaver is quicker and less painful than shaving with a razor, too. 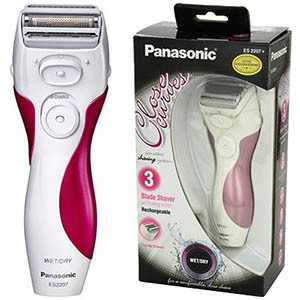 The best electric shaver for women is one that will provide a close shave without irritation. A woman has sensitive areas that require careful shaving with attachments meant to prevent cuts, bumps, and nicks. These are some of the best women's electric razors on the market. 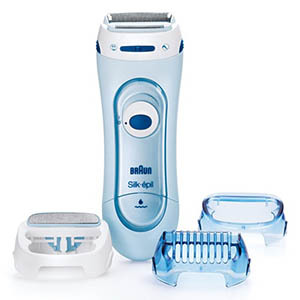 They are great for women with sensitive skin as well as women who want to take these shavers on vacation. There's a shaver on this list for every woman who wants to use an electric shaver to avoid irritation.